Since independence, India has sought to industrialise. Initially, this was along the lines of a centrally planned economy, but now its government appears to have abandoned protectionist policies and opted for free trade. But not all sections of Indian society look set to benefit from this rush to embrace the western model of economic development. In the firing line are the so-called "tribals" who have never been part of the traditional Indian caste system. Their age-old way of life is vanishing fast, as the authorities seek to "consolidate" smallholdings. Tribal peoples see this as a concerted effort to remove them from the dwindling jungle. The issue is featured in Is Small Still Beautiful?, a film in the Earth Report series made by TVE and shown on BBC News 24, BBC One and BBC World. Indian officials told TVE that consolidation was part of the process of modernisation and that the tribals would be properly compensated. But the tribals argue that their basic human rights are being trampled on. 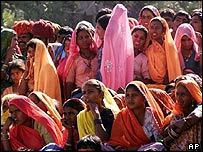 Three-quarters of India's billion-plus population still live in villages. This is changing. Every year, two million people leave the countryside for the towns. Most end up in slums. Tithuru Singh Moravi, is headman of Bamhani, a tribal village whose people still make a living from the forests. 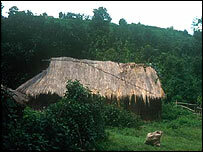 He told TVE: "We have lived with the jungle for hundreds of years. We can't survive anywhere else. We're used to living [here]. We are happier than those living in towns. The jungle is a very healthy environment." People who make a living from the forest have historic rights to their home. But when TVE visited the jungles of Orissa and Chattisgarh, the tribal peoples explained that it appeared the Indian authorities would prefer to see them moved. Without formal written legal title to their land, tribal peoples say they cannot even make basic improvements, such as digging small ponds to supply water through a drought. The authorities have a different view. They feel their job in a nation where wild areas are fast disappearing is to safeguard biodiversity and boost timber production. But one organisation has been standing up for the villagers' rights. Ekta Parishad was established by urban intellectuals concerned about the fate of tribal people who have no way of standing up to the authorities and the courts. 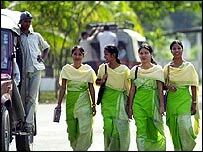 "Ekta Parishad is working in about eight states of India. The basic idea is to bring back Gandhian philosophy into action," Raj Gopal, organiser of Ekta Parishad, told TVE. "That is what we are trying to do. In a fast globalising world, where abuse of capitalism has become the order of the day, we are trying to remind policy makers and planners that there is another way to go about [things]." Mr Gopal warns that many tribal peoples will lose out on compensation: "There are lots of people without land who will be displaced and will get no compensation - nothing. This is the usual trend in this country; if you do not have a piece of land, you get nothing." But Indian officials disagree, adding that tribal people must give up some things in order to gain from India's economic boom. KV Singh Deo, Orissa Industry Minister, told TVE: "The government of India as well as the state government has come up with a scheme where one member of each displaced family is given employment in whatever activity of industrialising takes place. "They accommodate one member of the family and a suitable rehabilitation package with regards to school, house, water supply. Everything is made available to the displaced persons." Raj Gopal objects to the way tribal life is viewed in some quarters. He told TVE: "Less consumption is not backwardness. How do you measure it now? People who don't consume much are backward, and people who consume more are forward? "The trend is very clear; that you need all the resources of the world in order to protect the interests of a few. "The industries are coming in, walking in with suitcases full of money, and they are taking land, water; they are taking whatever resources there are locally and displacing the adivasis and government are keeping their eyes shut." In India, the world's biggest democracy, 70% of the population still live on the land. But many smallholder farmers have become cynical about how their interests are represented by politicians. "All political parties should be forced to give it in writing, and if they don't, then you have this piece of paper signed by them; hold them in the street, sit in front of their car, go to the newspaper and show the paper, and put them to shame," says Raj Gopal. The official policies of consolidating landholding to increase efficiency are bitterly opposed, leading to violent protests in some parts. But Ekta Parishad says it is committed to peaceful protest. "I have a larger plan, taking out a march of 50,000 to Delhi," says Raj Gopal. "Walking 300km will take at least 10 to 15 days, and no government can really stand that. "You know, getting the national highway blocked for 15 days is something unthinkable for any government. As a result, the government will have either to use repression or the technique of negotiation. I am ready for both."